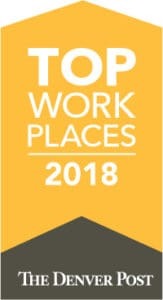 Applewood Plumbing Heating & Electric (www.ApplewoodFixIt.com) has been named one of Colorado’s Top Workplaces for 2018 by the Denver Post. More than 1,000 organizations participated in the survey and 150 companies, including Applewood, have been recognized as one of Colorado’s Top Workplaces. Applewood was ranked 23rd in the small company category, making this the sixth time they made the list of Top Workplaces. Employees participated in a workplace survey evaluating the company’s environment in seven areas including alignment, effectiveness, connection, management, employee engagement, leadership and the basics. Applewood Plumbing will be listed in a special edition of The Denver Post and online. They were first named one of Colordao’s Top Workplaces in 2012 and have earned the title five additional times.